Gules, a double-headed Imperial Eagle displayed, twice imperially crowned, grasping in the dexter claw an imperial sceptre, and in the sinister claw an imperial orb, all Or. In chief another larger imperial crown with issuant and pendent therefrom a ribbon of the Order of St. Andrew the First-Called, also Or. The Imperial Eagle is charged on the breast with an escutcheon: Gules, an image of St. George Martyr the Victorious in complete armour Argent, wearing a flying cloak Azure, riding a horse in full gallop Argent; the latter treading upon a dragon crawling in base Or, whose head the rider is piercing through with a spear Argent. "The obverse: in the center — the relief image of Saint George the Victorious on horseback killing a serpent with a spear;"
in the website's description of the obverse, or the front side, of Russia's currently circulating one, five, ten, and fifty kopeck coins. The current coat of arms was designed by artist Yevgeny Ukhnalyov; it was adopted officially on November 30, 1993 . Today, the imperial crowns on each head stand for the unity and sovereignty of Russia, both as a whole and in its constituent republics and regions. The orb and scepter grasped in the eagle's talons are traditional heraldic symbols of sovereign power and authority. They have been retained in the modern Russian arms despite the fact that the Russian Federation is not a monarchy, which led to objections by the Communists even though both the blue ribbon and the collar of the Order of St. Andrew (which in the imperial arms supported the three crowns and surrounded the central shield) have been removed from the current coat of arms. The heraldic device of Russia has gone through three major periods in its history, undergoing major changes in the transitions between the Russian Empire, the Soviet Union, and the Russian Federation. 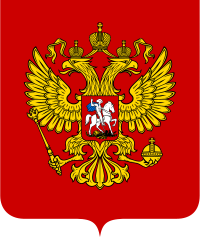 The use of the double-headed eagle as a Russian coat of arms goes back to the 15th century. With the fall of Constantinople and the end of the Byzantine Empire in 1453, the Grand Dukes of Muscovy came to see themselves as the successors of the Byzantine heritage, a notion reinforced by the marriage of Ivan III to Sophia Paleologue (hence the expression "Third Rome" for Moscow and, by extension, for the whole of Imperial Russia). Ivan adopted the golden Byzantine double-headed eagle in his seal, first documented in 1472, marking his direct claim to the Roman imperial heritage and posing as a sovereign equal and rival to the Holy Roman Empire. In 1497 it was stamped on a charter of share and allotment of independent princes' possessions. At about the same time, the image of a gilt, double-headed eagle on a red background appeared on the walls of the Palace of Facets in the Moscow Kremlin. The other main Russian coat of arms, the image of St George slaying the dragon, is contemporaneous. In its first form, as a rider armed with a spear, it is found in the seal of Vasili I of Moscow in 1390. At the time of Ivan III, the dragon was added, but the final association with Saint George was not made until 1730, when it was described as such in an Imperial decree. Eventually, St George became the patron saint of Moscow (and, by extension, of Russia). The Russian Empire had a coat of arms, displayed in either its greater, middle and lesser version. Its escutcheon was golden with a black two-headed eagle crowned with two imperial crowns, over which the same third crown, enlarged, with two flying ends of the ribbon of the Order of Saint Andrew. The State Eagle held a golden scepter and golden globus cruciger. On the chest of the eagle there was an escutcheon with the arms of Moscow, depicting Saint George, mounted and defeating the dragon. After approval by Alexander III on 24 July 1882, the greater coat of arms was adopted on November 3, replacing the previous 1857 version. Its central element is the coat of arms, crowned with the helmet of Alexander Nevsky, with black and golden mantling, and flanked by the archangels Michael and Gabriel. The collar of the Order of Saint Andrew is suspended from the coat of arms. The whole lies within a golden ermine mantle, crowned by the Imperial Crown of Russia and decorated with black double-headed eagles. The inscription on the canopy reads: Съ Нами Богъ ("God is with us"). Above the canopy stands the state khorugv, of gold cloth, on which is depicted the Medium State Seal. The banner is topped by the State Eagle. Around the central composition are placed fifteen coats of arms of the various territories of the Russian Empire. Nine of these are crowned and placed on a laurel and oak wreath. Proceeding from the left in a counter-clockwise direction, these represent, as they are included in the full imperial title: the Khanate of Kazan, the Kingdom of Poland, Tauric Chersonesos, the unified coat of arms of the Grand Principalities of Kiev, Vladimir and Novgorod, the dynastic arms of the House of Holstein-Gottorp-Romanov, the Grand Principality of Finland, the Georgian principalities, and the Khanates of Siberia and Astrakhan. The six upper escutcheons are joint depictions of various smaller principalities and oblasts. From the left in a clockwise fashion, these are: the combined arms of the northeastern regions (Perm, Volga Bulgaria, Vyatka, Kondinsky, Obdorsk), of Belorussia and Lithuania (Lithuania, Białystok, Samogitia, Polatsk, Vitebsk, Mstislavl), the provinces of Great Russia proper (Pskov, Smolensk, Tver, Nizhniy-Novgorod, Ryazan, Rostov, Yaroslavl, Belozersk, Udorsky), the arms of the southwestern regions (Volhyn, Podolsk, Chernigov), the Baltic provinces (Estonia, Courland and Semigalia, Karelia, Livonia) and Turkestan. The Middle Coat of Arms (Средний государственный герб Российской Империи) is similar to the Great Coat of Arms, excluding the khorugv and the six upper escutcheons. The Abbreviated Imperial Title is inscribed over the perimeter of the Seal. The Lesser Coat of Arms (Малый государственный герб Российской Империи) depicts the imperial double-headed eagle, as used in the coat of arms, with the addition of the collar of the Order of Saint Andrew around the escutcheon of St. George, and the Arms of Astrakhan, Siberia, Georgia, Finland, Kiev-Vladimir-Novgorod, Taurica, Poland and Kazan on the wings (seen clockwise). In the beginning of the 17th century, with the ascension of the Romanov dynasty and its contacts with Western Europe, the image of the eagle changed. In 1625, for the first time the double-headed eagle appeared with three crowns. Traditionally, the latter have alternatively been interpreted as representing the conquered kingdoms of Kazan, Astrakhan and Siberia, as stated in the first edict concerning the state seal, on 14 December 1667, or as standing for the unity of Great Russia (Russia), Little Russia (the Ukraine) and White Russia (Belarus). Probably under influence from its German equivalent, the eagle, from 1654 onwards, was designed with spread wings and holding a scepter and orb in its claws. During the reign of Peter the Great, further changes were made. The collar of the newly established Order of Saint Andrew was added around the central escutcheon, and the crowns were changed to the imperial pattern after his assumption of the imperial title in 1721. At about this time, the eagle's color was changed from golden to black, which would be retained until the fall of the Russian monarchy in 1917. A final form for the eagle was adopted by imperial decree in 1729, and remained virtually unchanged until 1853. During the early 19th century, the eagle designs diversified, and two different variants were adopted by Emperor Nicholas I. The first type represented the eagle with spread wings, one crown, with an image of St.George on the breast and with a wreath and a thunderbolt in its claws. The second type followed the 1730 pattern, with the addition of the arms of Kazan, Astrakhan and Siberia on its left wing and those of Poland, the Taurica and Finland on the right one. In 1855–57, in the course of a general heraldic reform, the eagle's appearance was changed, mirroring German patterns, while St George was made to look to the left, in accordance with the rules of Western heraldry. At the same time, the full set of coat of arms of Great, Medium and Minor Arms, was laid down and approved. The final revisions and changes were made in 1882–83, and are those described above. The Soviet Union state motto ("Workers of the world, unite!") in Russian ('Пролетарии всех стран, соединяйтесь!' — Proletarii vsekh stran, soyedinyaytes!) is also a part of the coat of arms. The acronym of the RSFSR is shown above the hammer and sickle, and reads 'PCФCP', for "Российская Советская Федеративная Социалистическая Республика" (lit. Russian Soviet Federative Socialist Republic). The Soviet Union as a whole adopted its emblem in 1923, which remained in use until the dissolution of the Soviet Union in 1991. Although it is technically an emblem rather than a coat of arms, since it does not follow traditional heraldic rules, in Russian it is called герб (gerb), the word used for a traditional coat of arms. It was the first state insignia created in the style known as socialist heraldry, a style also seen in e.g. 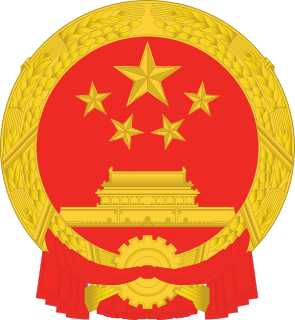 the emblem of the People's Republic of China. The emblem shows the Soviet emblems of the Hammer and Sickle and the Red Star over a globe, in the centre of a wreath wrapped in ribbons emblazoned with the Soviet motto ("Workers of the world, unite!") in the official languages of the Soviet Republics, in the reverse order they were mentioned in the Soviet Constitution. Each Soviet Republic (SSR) and Autonomous Soviet Republic (ASSR) had its own coat of arms, largely inspired by the state emblem of the Union. Four versions were used: 6 ribbons were used in 1923, which were written on in Russian, Ukrainian, Belarusian, Georgian, Armenian, and Azerbaijani; 11 ribbons with the addition of Turkmen, Uzbek, Tajik, Kazakh, Kyrgyz; 16 with the addition of Estonian, Latvian, Lithuanian, Moldavian, and Finnish. Finally, the inscriptions in Azerbaijani, Turkmen, Uzbek, Tajik, Kazakh and Kyrgyz were updated to reflect their transition from the Latin to the Cyrillic script. The final version of the emblem was adopted in 1956 with the removal of the Finnish inscription from the insignia, reflecting the 1956 transformation of the Karelo-Finnish SSR into the Karelian ASSR. In 1992 the inscription was changed from RSFSR ('РСФСР') to the Russian Federation ('Российская Федерация') in connection with the change of the name of the state. In 1993, the Communist design was replaced by the present coat of arms (see the top of this article). ^ Ivanov, Dmitry. "Geral'dika segodnya || Yevgeny Il'ich UKHNALYOV (1931-2015)" Геральдика сегодня || Евгений Ильич УХНАЛЁВ (1931-2015) [Heraldry today || Evgeny Ilyich UHNALYOV (1931-2015)]. sovet.geraldika.ru. Retrieved 2018-02-12. Aq Bars is the emblem of Tatarstan. It is an ancient Bulgar symbol translated as "White Leopard" or "Snow Leopard", and has been in use since 1991 as the official symbol of Tatarstan. The coat of arms of Ossetia is a disk gules with a Caucasian leopard passant or with sable spots on a ground or with a background of seven mountains argent. The mountains on the seal symbolize the Ossetian landscape, while the leopard is an iconic inhabitant of the Caucasus mountains. The coat of arms of Saint Petersburg is the official symbol of the city and was adopted in April 2003. The national emblem of the Bashkir Autonomous Soviet Socialist Republic was adopted in 1937 by the government of the Bashkir Autonomous Soviet Socialist Republic. The device is based on the emblem of the Soviet Union. The national emblem of the Chuvash Autonomous Soviet Socialist Republic was adopted in 1937 by the government of the Chuvash Autonomous Soviet Socialist Republic. The emblem is identical to the emblem of the Russian Soviet Federative Socialist Republic. The national emblem of the Mordovian Autonomous Soviet Socialist Republic was adopted in 1937 by the government of the Mordovian Autonomous Soviet Socialist Republic. The emblem is identical to the emblem of the Russian Soviet Federative Socialist Republic. The national emblem of the Udmurt Autonomous Soviet Socialist Republic was adopted in 1937 by the government of the Udmurt Autonomous Soviet Socialist Republic. The emblem is identical to the emblem of the Russian Soviet Federative Socialist Republic.